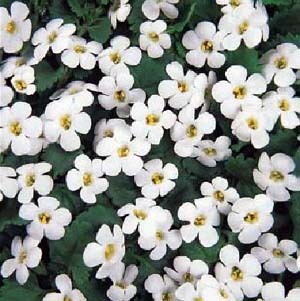 The specific epithet name “cordata” means heart-shaped. Named after J. R. Suter (1766-1827), Swiss botanist and author of “Flora Helvetica” in 1802. Many species in this 3000 plus species family are grown for ornamental and medicinal purposes including slipperwort, speedwell, mullein, bearded-tongue, foxglove, snapdragon, toadflax, monkey-flower, cape-fuchsia, coral-plant, nemesia, and blue-lips. Some favorite cultivars and their respective flower colors include ‘Cabana’ (white) and ‘Lavender Storm’. Will generally do well in light levels at least bright enough to read a newspaper in comfort but more light would be better. Using the cultivar ‘Snowflake’, Williams, Starman and Faust (1999) report that they recommend this species as a spring crop only (not summer) as warm postharvest temperatures (greater than about 80F) can greatly reduce quality.